The heat of summer is officially here. I come home from work and the first thing I do is open all the windows and screen doors. I like to air out the house and make sure the cold air flows in and out. I do this even before I put my purse down. It’s a habit now. After I feel the cool air comes in, I then put away my lunch box, put my hair up and find the nearest shorts I can grab. I ran this morning and I felt the heat on my face. Normally, when I run first thing in the morning, I just wash my face, get dressed and I’m out the door. After today’s run, I might have to add “put on sunscreen” to that routine or start wearing a hat at 6:30am. Because it’s warm, I’m also not in the mood to stand on the stove and cook dinner every night. But I also don’t want to get take-out or fast food often either. So what I’ve been doing is pre-cooking dinners on the weekends and have them available for us to eat throughout the week. 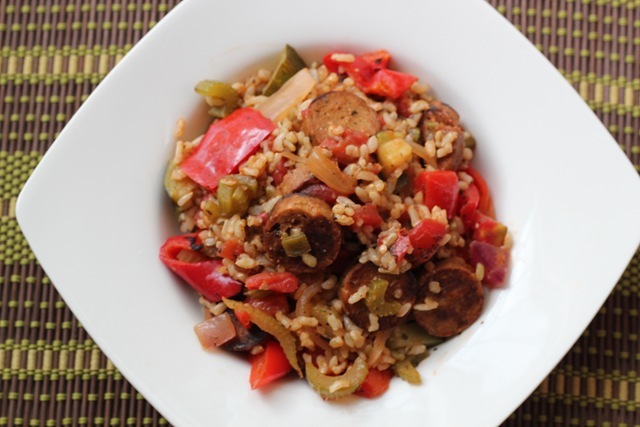 I made Vegan Jambalaya recently from one of my favorite cookbooks, Peas and Thank You, Simple Meatless Meals. 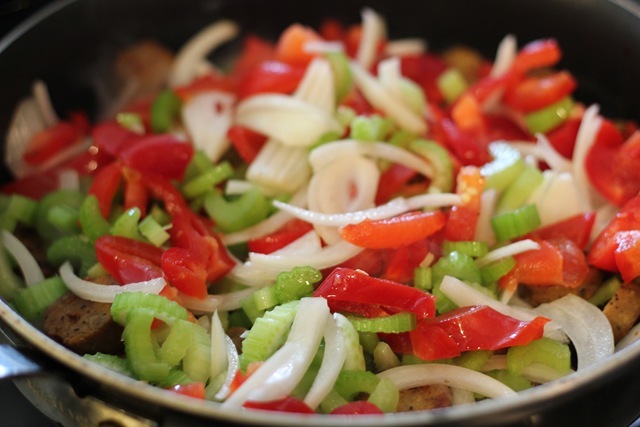 What I like about the recipe is that it makes a big batch and made with simple ingredients. 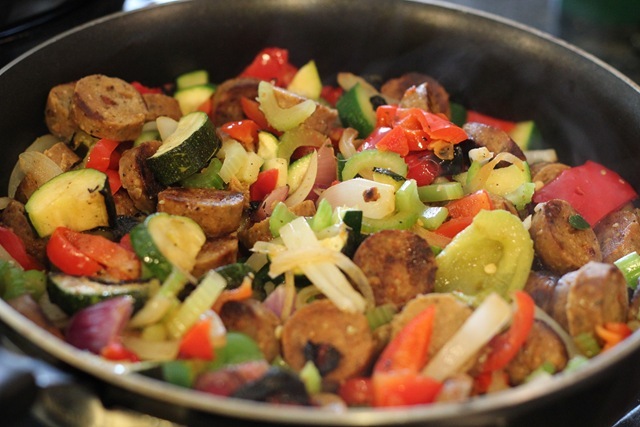 I added more vegetables that what the recipe called for, I love adding volume to food by adding all my favorite vegetables. 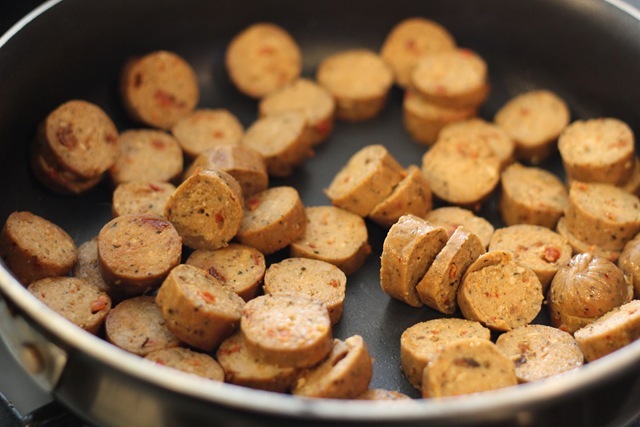 I used meatless sausage from Trader’s Joe’s but you can also substitute it with any sausage you want. I like to add a ton of vegetables because it wilts to half its size anyways. 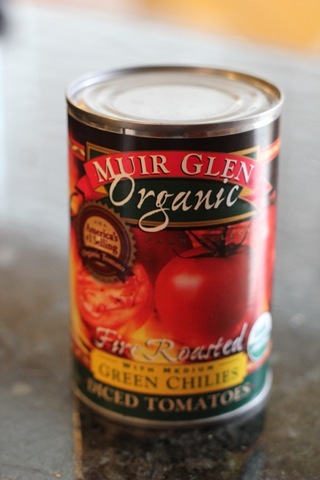 I also used Muir Glen’s Organic diced tomatoes WITH green chilies. I think it makes a difference in the taste. I love anything fire roasted. 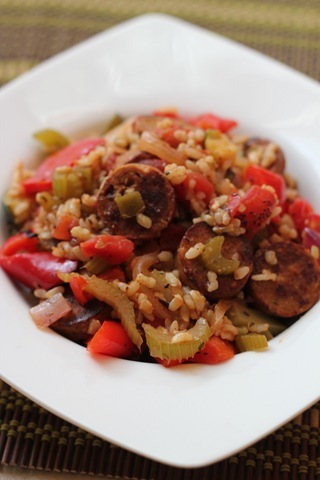 This dish is also a great way to use up brown rice leftovers, which we always have around. Spray a large skillet with cooking spray and place over medium-high heat. Add sausages and cook until beginning to brown, about 5 minutes. Add garlic, basil, oregano, and parsley and saute for an additional minute. Add tomatoes and broth and bring to a low boil, then lower heat. Cover and simmer for 10 minutes. 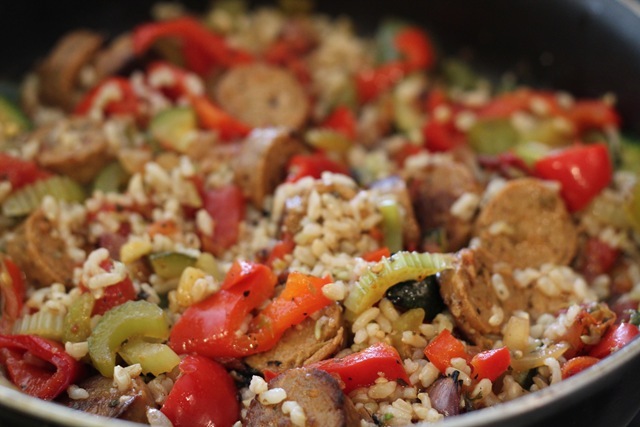 Add cooked rice or quinoa and allow to absorb sauce and flavors, stirring and cooking for an additional 10 minutes. Season with salt and pepper to taste. This is one of those dishes that taste better the following day, after all the flavors have a chance to mix and settle. We enjoyed this recipe. It is made from scratch and not from a box mix (although we make those too) but I like this dish better. Fresh is always better. Are you feeling the summer heat yet? What’s the weather like where you live? 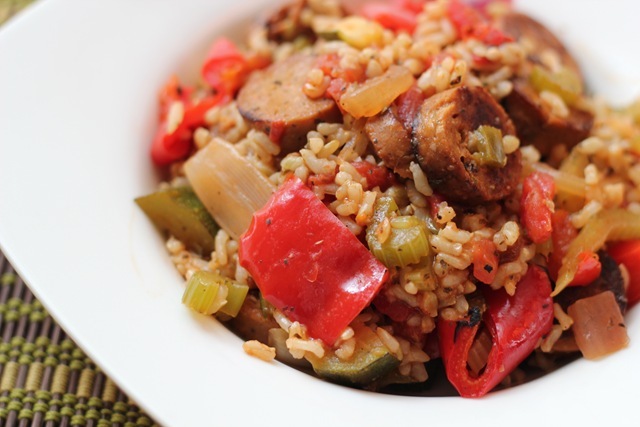 This vegan jambalaya looks good. The summer heat is definitely coming! We just had a heat wave in Boston last week, and I think we’re having one again this weekend. When I ran this morning too, the sun was intense!